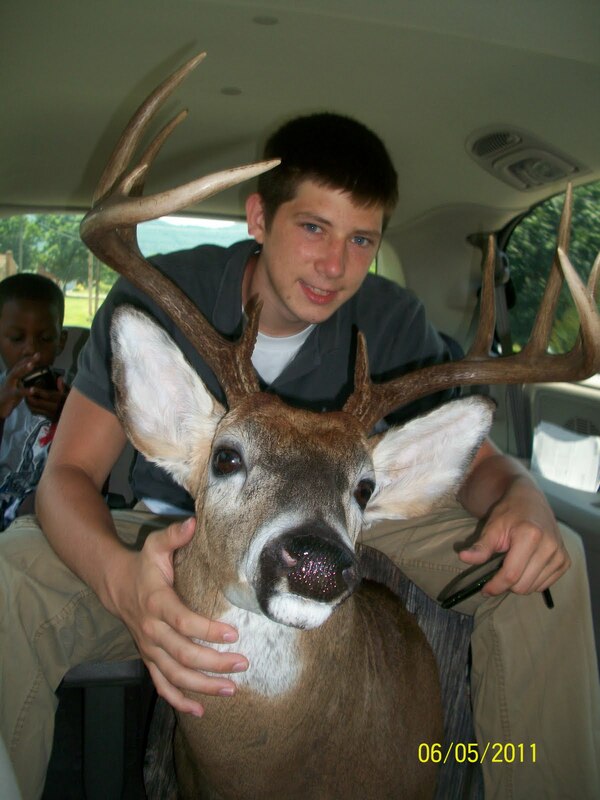 Shayne killed his second deer last November. 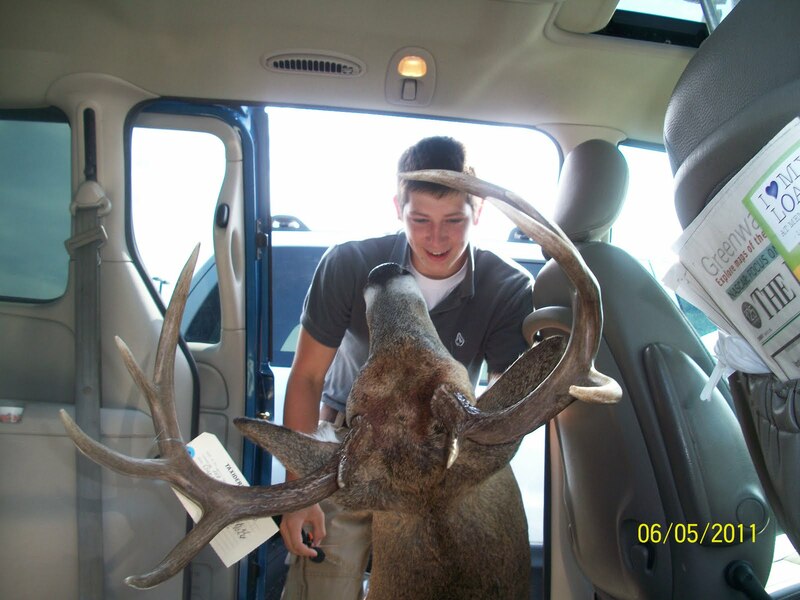 It was a big one- about 200 lbs, 10 pts- about 6 yrs old. One of Shayne's gifts for Christmas was us getting that deer stuffed or mounted. I don't know the official wording- just knew that he was coming home to live over my fireplace- sometime by June. Yes, my fireplace. I understand, from other hunters that it is highly unusual such agreement of a dead deer to hang in such a central room in one's home; and not banned to a garage, or a man-cave. I just keep telling Shayne I expect big points for this, and should he ever find himself in front of a counselor one day, speaking of all my failures as a mom, that he balance the scale with- "but she did let me hang my deer over the fireplace in the living room when I was 16." He went to Camp Eagle on Thursday to start his summer of work. He wasn't expected to come home until next Friday. One of the last things uttered as I left him in the woods, "I want my deer." 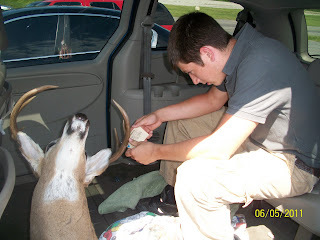 Yesterday, Rex and Gary (Shayne's hunting buddy) went and picked him up. I seriously was dreading this call, I was afraid I might be repulsed by the animal. It almost seemed a little too personal to stare into the eyes of one you've been eating. I just wasn't sure how that would play out. Now, this deer does have a name. When he was shot, it was obvious to Shayne he had been in many fights- so it seemed right to name him Tyson! I have come to appreciate (like if you will) Tyson. He is soft, and quiet. I do so like quiet things in my house. I have also found myself a little protective of him- and actually, I've been talking to him a little bit. That does not need to be repeated! We planned to surprise Shayne when he got home from camp Friday night, by having Tyson hanging over the fireplace. But we were so excited, we knew Shayne would be excited too. We thought of driving Tyson to camp last night for a visit, but I was afraid we might disrupt things. 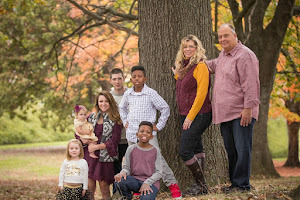 So, when the opportunity came up to go to Shenandoah Baptist for church with Shayne this morning, we took Tyson with us. The suspense was mounting, I couldn't wait to see his face. Christmas in June! Oh, yeah there is that smile I adore. I asked Shayne if it was a Christmas present worth the long wait- YES! Dropping Shayne back at camp after lunch, I think it was harder for him to leave Tyson than it was for him to leave me. Oh well, there's just something about a man and his deer! Now, how to get him over the fireplace. We Made It To SILVER, Baby!